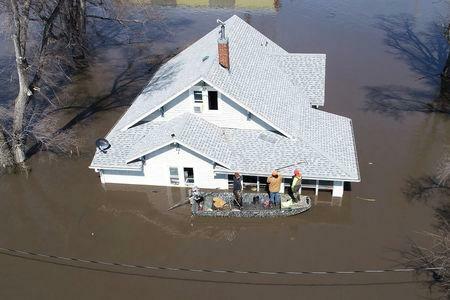 (Reuters) - Floodwaters continued to rise in the U.S. Midwest on Monday and were not expected to crest for another 24 hours, forecasters said, after killing three people in Nebraska and Iowa and inundating a U.S. Air Force base. The Missouri River, the longest in North America, has flooded much of Nebraska between Omaha and Kansas City at the Missouri state line. It was expected to crest at 47.5 feet (14.48 m) on Tuesday, breaking the previous record, set in 2011, by more than a foot, the Nebraska Emergency Management Agency (NEMA) said in the latest bulletin on its web page. Ricketts and Iowa Governor Kim Reynolds have both declared states of emergency, and U.S. President Donald Trump said the White House had reached out to state and local officials in devastated areas. At least 30 buildings had been flooded by up to 8 feet of water and 30 more structures had been damaged on the base, the Omaha World-Herald reported, citing a base spokeswoman. Base officials did not respond to a request for comment. The National Weather Service reported some of the region's larger rivers were running at record high levels, causing levee breaks. Some small towns and communities have been cut off by floods while others found themselves short of fresh drinking water. Warmer temperatures will speed the pace of snow melt across the region and contribute water to already swollen rivers, the NWS said, possibly forcing more evacuations in communities along the Missouri River on the Nebraska and Iowa border, as well as along the Elkhorn and Platte rivers in Nebraska. "There could be issues across portions of Nebraska and Kansas for the next seven days," NWS meteorologist Jim Hayes said.